.648 OPS? Promote that man. But let’s pretend for a moment that the Columbia Fireflies’ left fielder doesn’t have a Heisman Trophy, nearly 7 million followers on Twitter and Facebook and one of the sports world’s most successful brands. If he were your run-of-the-mill anonymous prospect delivering this level of performance, just how peculiar would his promotion be? The answer, as expected, is that it’s very, very peculiar. Tebow’s resume with the Fireflies was hardly awe-inspiring: In 64 games, he posted a .648 OPS, which would be poor for a third baseman, never mind a left fielder. Nor was his defense excellent, as his seven errors show. In fact, his overall performance was so poor that his promotion is one of the least probable in the last decade. Baseball Prospectus keeps detailed numbers on the low-A leagues going back to 2005. They track everything from slugging percentage to fielding runs above average, then total it all up into a minor league version of wins above replacement. 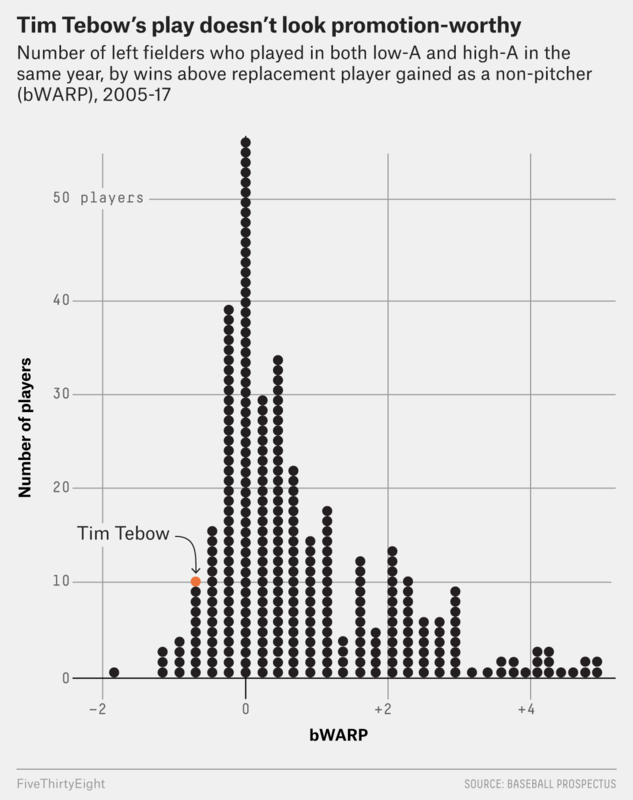 According to that metric, Tebow’s season was actually below replacement level, in the 4th percentile of performance in the last 12 years of low-A ball. In fact, only 17 corner outfielders have posted worse seasons and still played in high-A within the same year. With that said, minor league wins above replacement numbers must be taken with a grain of salt. Data from the levels below MLB is much less trustworthy, and the shorter seasons mean smaller sample sizes from which to draw conclusions. But you don’t need a total value calculation to confirm that Tebow has been outmatched on the field. Scouts have called his swing “stiff” and identified his pitch recognition as a potentially fatal flaw. When asked about the promotion, Mets General Manager Sandy Alderson made no mention of Tebow’s marketability, pointing instead to his “on-base, his isolated power, his swing, exit velocity.” We don’t have access to all the metrics the Mets track at the minor league level, so it’s hard to prove or disprove Alderson’s assertion that Tebow has improved in the last two weeks. He did post a .311 on-base percentage despite only hitting for a .220 average, so at least he can take a walk. We don’t know whether Tebow’s underlying exit velocity is really impressive or not, but the record of players who were as bad as he was in low-A is not encouraging. Of the 77 left fielders to ever post seasons as poor as Tebow’s, only one — Franchy Cordero of the San Diego Padres — eventually made it to the majors, where he’s now producing at about replacement level, with a .405 BABIP that suggests he’ll regress. Of course, Cordero was only 20 years old when he last played in low-A, and it took him four long years to climb from there to the majors. At 29, Tebow has a much more difficult road to travel before he can sniff the National League. On the other hand, given his recent promotion to high-A, the Mets may be holding him to considerably lower standards for each level of advancement. If he maintains the same level of poor performance (according to WAR) that he turned in during his time in Columbia, he could rack up a .556 OPS with the St. Lucie Mets and still theoretically find his way to Double-A. As a baseball player, Tebow may be unimpressive, but as a demonstration of the power of marketing, he is unsurpassed.